ADVENTUREI think Okinawa is the best location for enjoying outdoor activities. The breathtaking beauty of Okinawa’s ocean cleanses our spirits and makes us feel one with nature. The brilliant colors painted on these transparent waters are often referred to as Okinawa Blue, describing the gradation of colors from clear blue, emerald blue, and deep blue that we see from the shallow beaches to the distant shore. Okinawa Islands are formed from coral reefs that developed to Ryukyu limestone, and in the surrounding waters are a great diversity of marine life. Visitors and locals enjoy the many marine activities available here, from diving and snorkeling, fishing, surfing, and more. 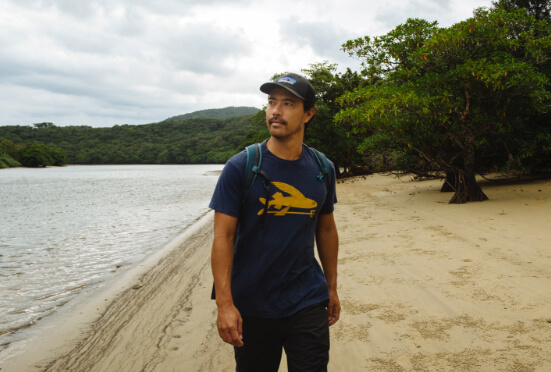 Okinawa’s seas and nature are what inspired Hayato Maki, a professional surfer, to relocate to Okinawa in 2011. Hayato has travelled across the globe to ride the waves and has lived in Tokyo, Hawaii, and also Chiba, a prefecture known to have some of the best surfing spots in Japan. Although he has yet to visit Africa and South America, his passion for surfing took him to places in America, Mexico, Papua New Guinea and many other countries, and out of all the places he’s visited in the world, he says that Okinawa’s ocean is the best. 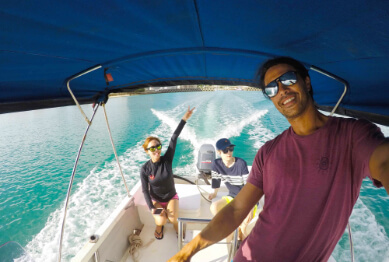 Hayato runs a business that offers custom-made tours that take full advantage of the weather, sea conditions and other factors to enjoy outdoor activities on Okinawa. Hayato says, “Since coming to Okinawa, I feel closer to nature. As I feel the turn of the tides and the direction of the winds throughout my days, I’m enjoying a lifestyle that’s in sync with the rhythm of nature.” On this occasion, Hayato will be on an adventure through the jungles of Iriomote Island, a place that’s still off the beaten track, trekking to the Mayagusku Falls that’s hidden deep in the forests. 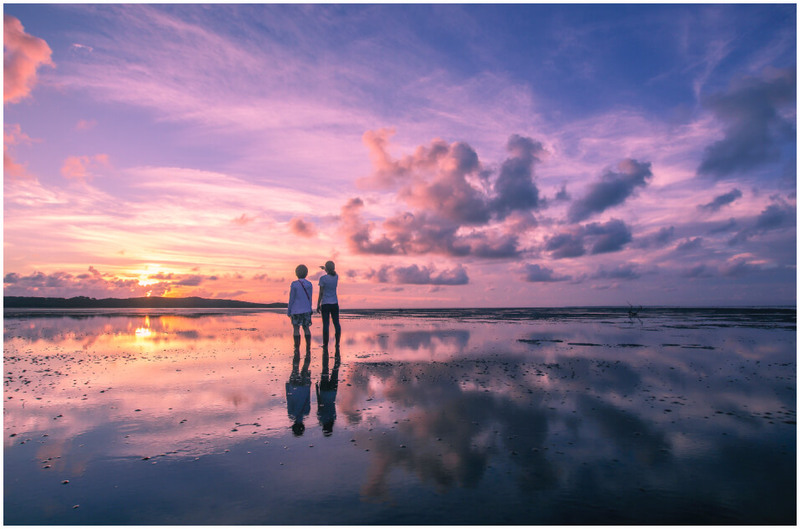 Across approximately 400 kilometers north to south, and 1,000 kilometers east to west, the Okinawa Islands are made up of 160 islands, small and large, floating on the crystal clear waters of the Ryukyu Archipelago. Among them, 47 of the islands are inhabited with Okinawa Island being the largest and the main island to from Okinawa Prefecture. Iriomote is one of the Yaeyama Island chain, and is the second largest island in the prefecture. Close to 40 rivers flow through Iriomote Island, bringing life to the subtropical jungles which cover 90% of the land. Near the mouths of the rivers are rich mangroves that add up to 25% of the mangroves found in all of Japan. The whole island is a national park and remains untouched, with no major roads that allow people to travel around the whole island in vehicles. The only way to get on the island is through the two ports located at the southeastern point and northern point on the island. 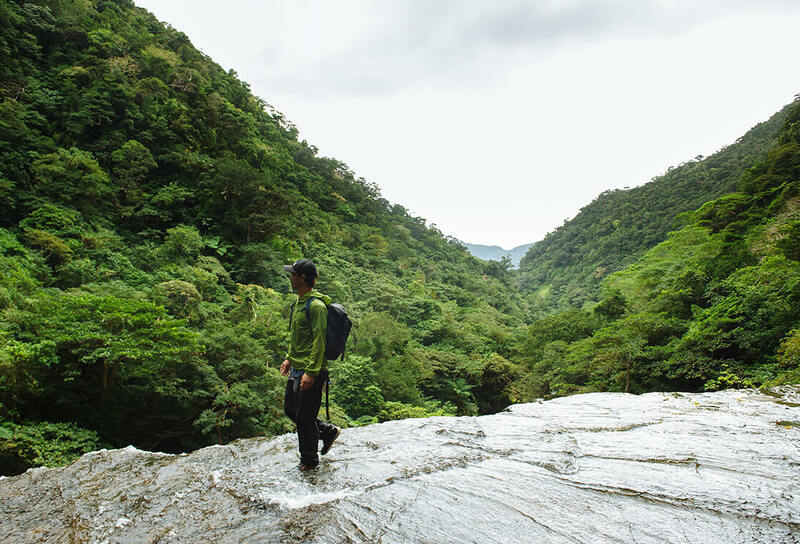 Iriomote is home to about 2,000 residents who live in villages that dot the island covered in jungles, and deep within the lush forestation is the day’s destination, the Mayagusuku Falls. 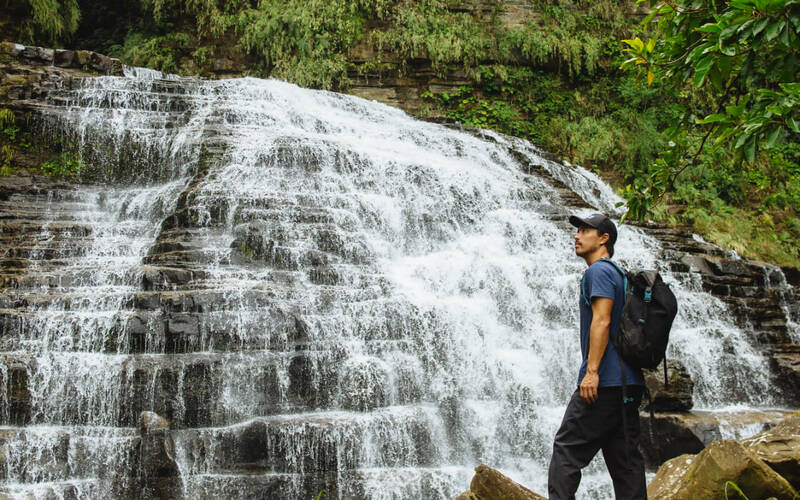 Mayagusuku Falls was only known to boar hunters and few other locals until not too long ago, and the route there is a little challenging and so the tour is recommended for those who are more confident about their physical fitness. On this tour to the waterfall was a guide from Sima Mari Asibi, nicknamed Naga, who is an expert on outdoor activities. As a student, he was in the mountaineering club and focused his studies on fieldwork. 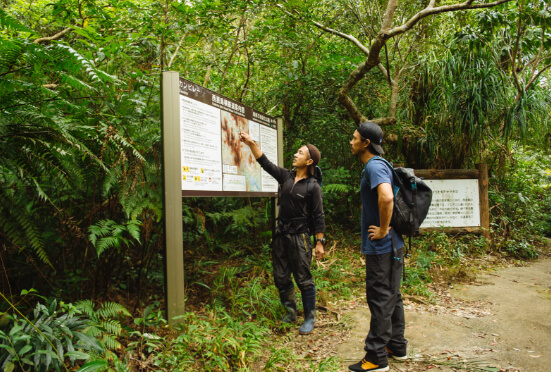 He also introduced the canyoning and caving activities on Iriomote Island, which are now two of the major activities offered on the island. In over the two decades he’s lived here, he has learned much about boar hunting, harvesting edible vegetation in the forests, and fishing from the local elders. 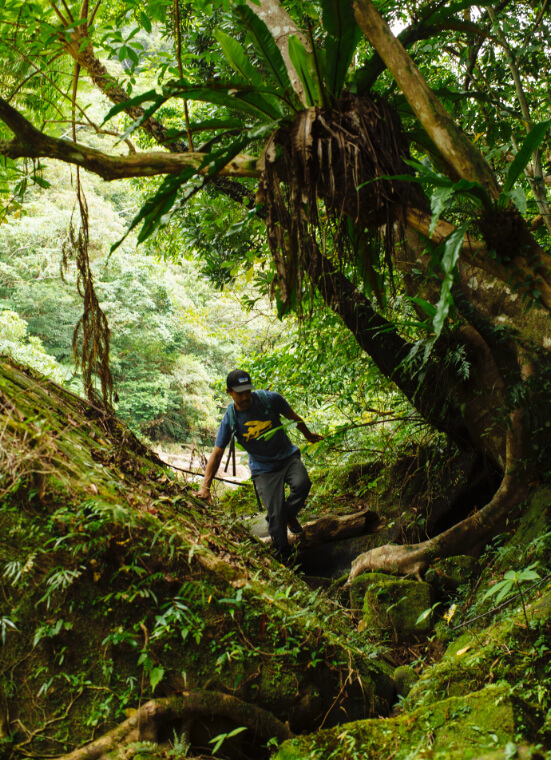 He hopes to show the visitors all the natural beauty the island has to offer, and it was this love for Iriomote Island that inspired him to start his business that he runs alone, offering tours for small groups. Upon meeting up at Uehara Port at 8:00 in the northern part of the island, Hayato and Naga got on an excursion boat to the upper reaches of Urauchi River, the longest river in Okinawa Prefecture. After about a 30-minute ride, the boat arrived at the start of the 25-kilometer trekking course which would take the group through the deepest part of the island’s jungles. After another 30 minutes, the group arrived at the observation point for Mariyudu Falls, a popular sightseeing spot on the island. Further along on the well-travelled trekking course is Kanbire Falls, and beyond this waterfall, the trail transforms to a more steep and challenging one where not many people enter. 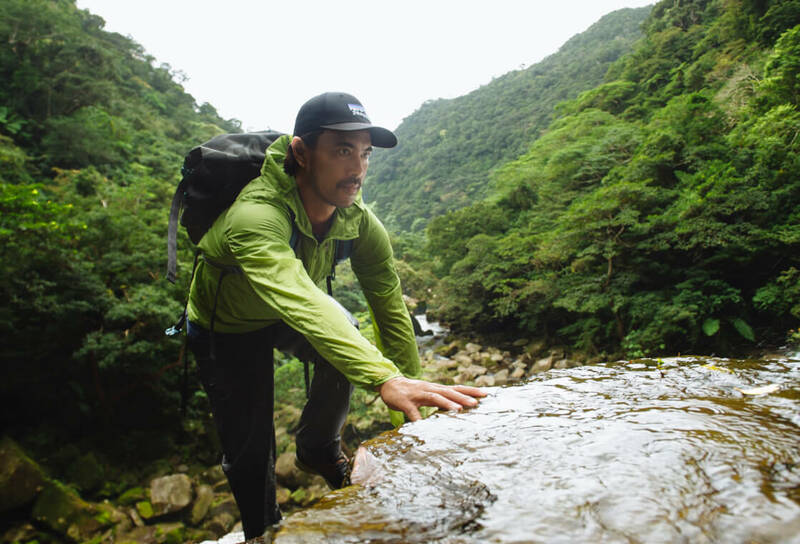 The trek continues through the dense growth of subtropical plants, with the sounds of animals in the jungles all around, and a challenging terrain with fallen trees and other obstacles along the way. Just before the destination is the final obstacle, the Itakichi River, an arm of Urauchi River where you have to cross on unsteady footing. Then finally, your eyes meet the magnificent sight of Mayagusuku Falls, with water flowing down the steps that fan out to the sides. As Naga says, “this is the reward for the hard work to get here”. He then took the group up Mayagusuku Falls and deeper into the back where the waterfall expanded. The best months to visit Mayagusuku Falls are from November to March when the volume of the water increases and the waterfall is simply dynamic. Take a break from your busy life and experience something extraordinary in the mangroves, the trails, and at the waterfall. Immerse yourself in the rich nature, and feel your body and spirit detox from the everyday stress. A business specializing in guided trekking tours on Iriomote Island for small groups of five to eight people. 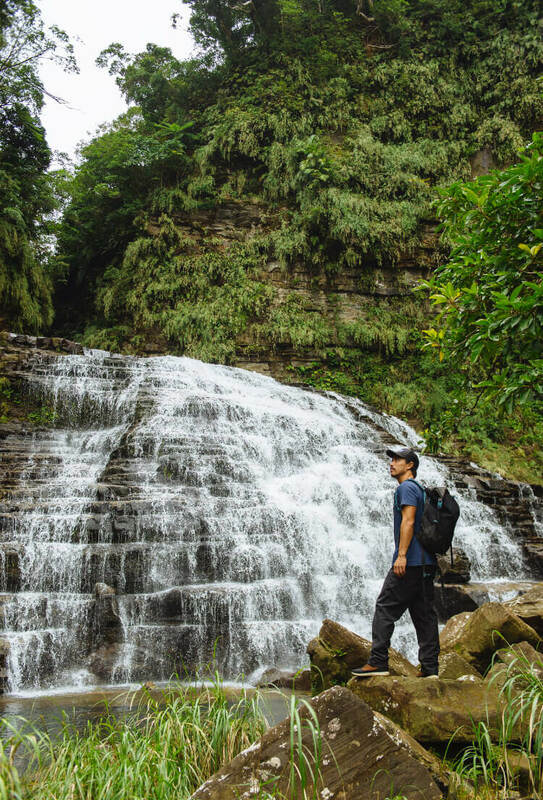 The trekking tour to Mayagusuku Falls is challenging, and starts with a notice that reaching the waterfall may not be possible, depending on the walking speed and physical conditions of the participants. The more challenging tours (like the trekking tour to Mayagusuku Falls) are conducted from mid-September to May to avoid heat exhaustion in the high humidity and temperatures of the tropical rainforest. The guide will be carrying a satellite phone for the safety of the group on these tours. 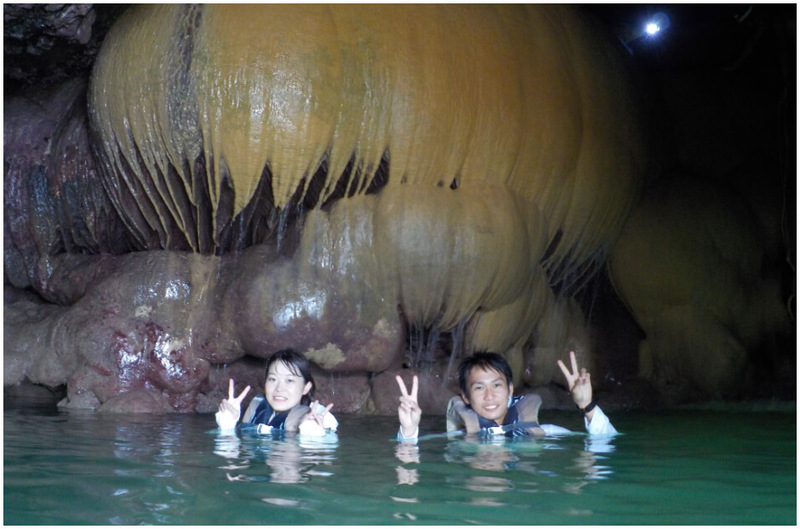 For people who are less physically confident, traveling with children, or just looking to enjoy a leisurely time, the company also offers more relaxed tours for visitors to enjoy the amazing nature of Iriomote Island. 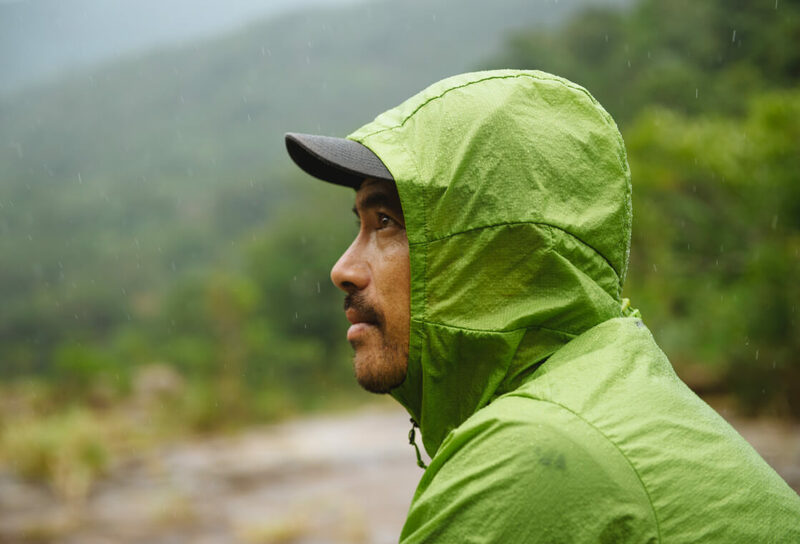 A professional surfer, spear fisherman, and founder of Simple Life Adventures, a company that offers various activities on Okinawa like surfing, SUP, and snorkeling. Hayato relocated to Chatan, Okinawa in 2011. Reefers The humpback whales that inhabit the waters of Siberia travel to the warmer waters of Okinawa from late December to early April to give birth and raise their calves. 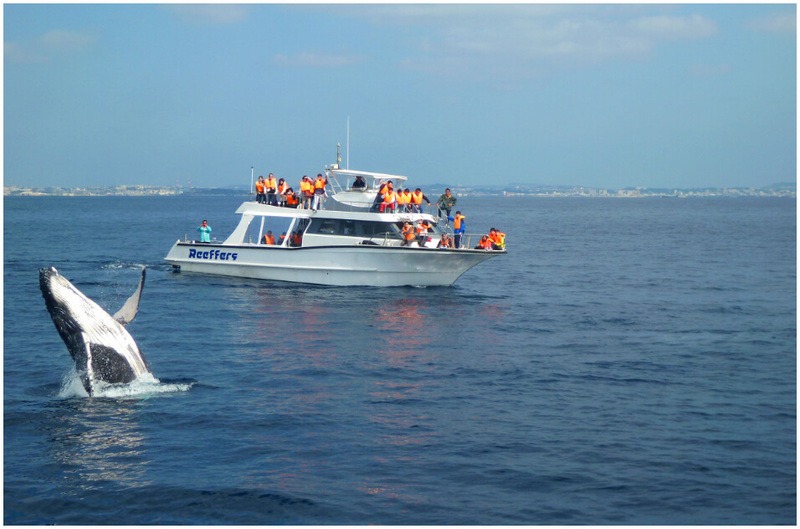 Seeing the dynamic activities of the whales will be an amazing, emotional experience you’ll never forget. 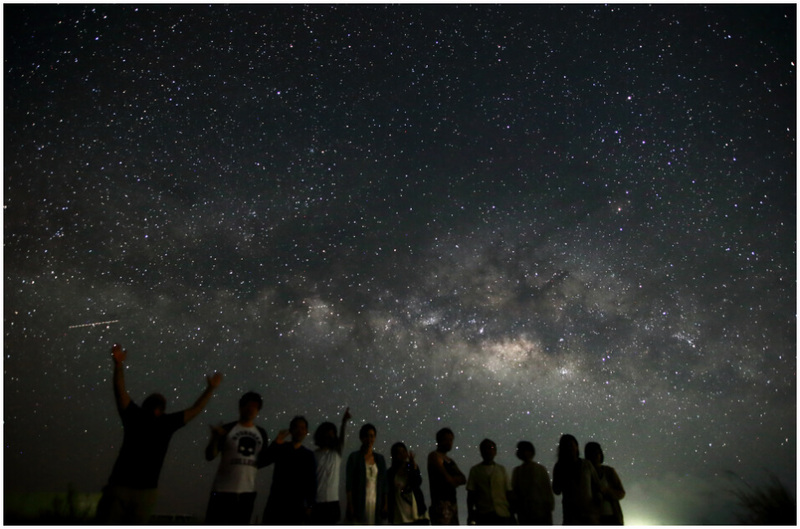 Ishigaki Island Starry Sky Farm Tour Tour participants can sit back in a reclining chair with a drink in hand at the special star-viewing space that commands a 360 degree view of the skies. Enjoy the Milky Way in the summer and the Southern Cross from May to mid-June. Coral-foundation Iriomotejima inc. Iriomote Island is a treasure trove of natural beauty and is the first in Japan to be recognized with the Starry Sky Conservation District Certification. A magical experience awaits as you depart in the early morning for a retreat along the shores or in a canoe tour while the stars and moon light the sky bringing beautiful gradation of colors of the morning. 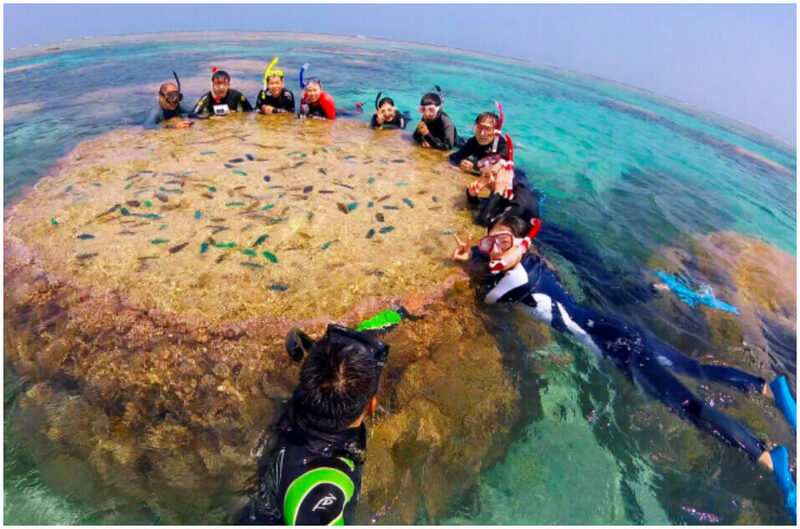 Coral Coast Under the seas of Okinawa are diverse seascape which will excite all adventure-seekers. Start your caving experience at the Pumpkin Hole, a stalactite cave that you can enter only during the low tide. Shiraho Tourism Service The waters of Shiraho on the eastern coast of Ishigaki Island is home to a great colony of blue coral and is a true natural treasure. Experience a snorkeling experience you’ll never forget in the 10 km stretch along the shores with over 120 types of coral colonies.